Founded in 1875, Sonor is one of the world's oldest drum company with an excellent reputation. Sonor Drums are known as the "Rolls Royce" of Drums with excellent craftsmanship. 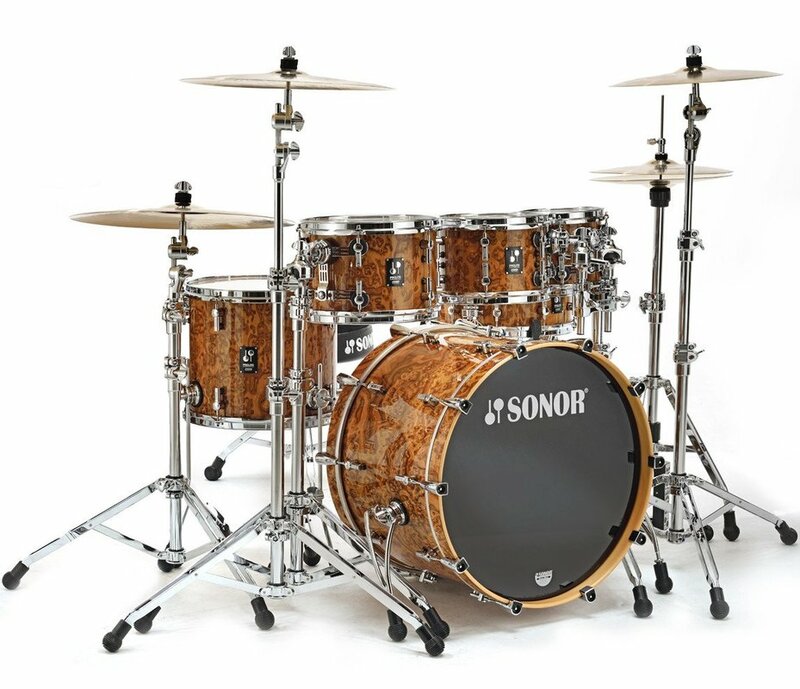 Sonor uses world class materials as they do not want to compromising on quality for price. 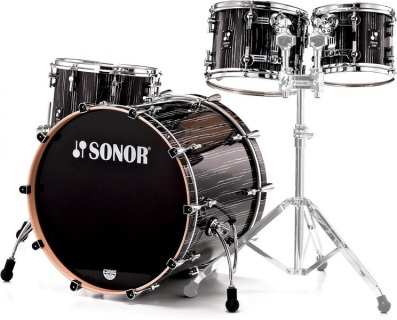 Rather, Sonor wants to provide the best value for the products that they make. Instruments that would last a lifetime of play. The AQ1 Series defines the entry into the world of the SONOR Sound - a birch shell kit, completed with a 5-piece 2000 Series hardware pack in our 2 popular configurations Stage and Studio, available in 2 classic, yet stunning high gloss lacquering finishes: Piano Black and Piano White. ​The AQ1 Series has been newly designed and engineered from ground up by the SONOR team in Bad Berleburg, Germany. Designed not only visual by a new lug and badge but also acoustical by the isolating "SmartMount" that allows for significant better resonance and sustain of the 100% all birch shell rack toms. If you're an ambitious beginner or already a SONOR enthusiast looking for the additional stage-ready drum kit - AQ1 is for you. Hardware Pack : 2000 Series Straight Cymbal Stand, Boom Cymbal Stand, Pedal, Hi Hat Stand, Snare Stand. OUND DEFINED. BE INDIVIDUAL. LOOK AMAZING. We offer five standard configurations to start with, all featuring our popular 7-ply all maple shell construction (4 plies of Canadian maple, 3 plies of Chinese maple). The drums share fittings and finishes, offering the flexibility to mix and match within the whole AQ2 Series. Sizes : 14x13, 8x7, 13x12, 12x5 Steel Snare. Comes with Tom Mount and Cymbal Arm. Drums does not come with Hardware Pack or Cymbals. Photo shown is a Safari Kit. The photo of the Tom is the correct finish for the drum set. Sizes : 16x15, 10x7, 13x12, 13x6 Maple Snare. Sonor introduces the SQ1 series, a new dimension in sound. Birch shells in combination with new innovative Sound Sustainer technology form the basis of a drum series with extraordinary sound characteristics. Together with exclusive matte lacquer finishes, a professional drum concept for live performance and studio recording was developed. Made in Germany. 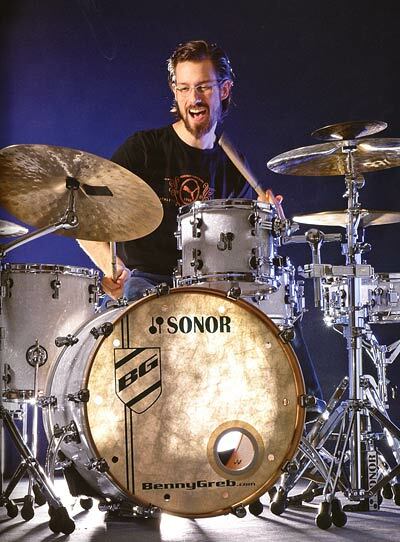 For decades Sonor has cooperated with scientific institutes to optimize the acoustic performance of their drums. Numerous pioneering concepts for the improvement of drum mounting systems have been developed. The new Sound Sustainer technology is based on concepts applied in the automotive industry. A 2-component connection (rubber to metal) enables complete isolation of the metal mount and the wooden shell. This guarantees a particularly long lasting and clean decaying sustain, not just for tom toms but also all floor toms in the SQ1 series. The colors and styles of legendary car classics were the inspiration for the color selection of the SQ1 series. Four matte lacquer surfaces are handcrafted with Sonor's precision sanding, polishing and lacquer procedures. A special lacquer is used to seal all inside shells. 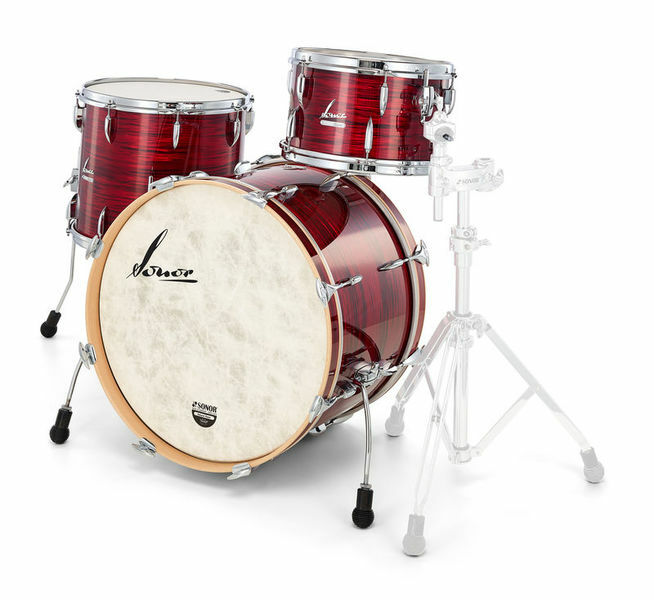 The Vintage Kit that we stock has the exact same sizes but a different finish from this video. Already in the 60's SONOR Teardrop kits were build to the highest quality standards and were highly rated by international stars like Connie Kay, Roy Haynes, Sonny Payne or Kenny 'Klook' Clarke. 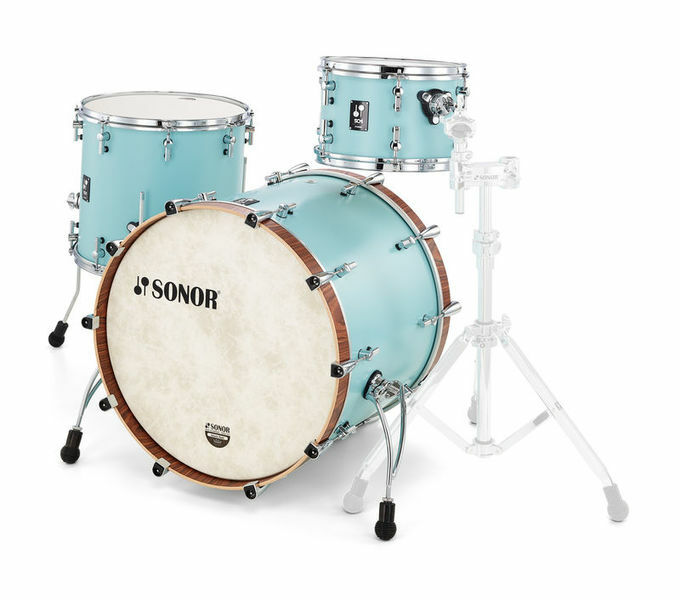 SONOR Teardrop kits are one of the most sought after vintage drums. Utilizing rounded bearing edges, the new VINTAGE series drums represent the return of the 'old SONOR sound' into its product line. SONOR introduced the 45 degree bearing edge in 1975, which we still use today on all SQ2, Prolite, and Force series drums. 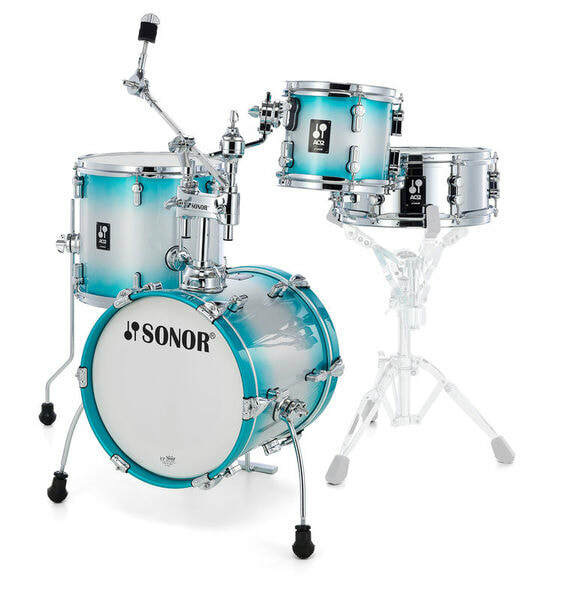 With the addition of the Vintage Series, drummers will have access to a complete palette of sounds that is uniquely SONOR. The SONOR team, in cooperation with artists and collectors, worked tirelessly to bring the new Vintage drum line as close as possible to the look, feel and sound of its predecessor the Teardrop drums. SONOR then combined its knowledge of modern drum building, with the look and sound of vintage drums, to create an instrument that will hold up to today's modern playing. Like in the original Teardrop drums, the VINTAGE drum series feature hand‐selected premium German Beech shells with rounded bearing edges. ​Being sure not to overlook any details, SONOR has redesigned the Superprofil triple flanged hoops and brought back the timeless SONOR badge and logo used in between 1952 and 1961. The heritage of over 135 years of Drum making experience meets the passion, knowledge and creativity of SONOR’s international team of design engineers, professional players, distributors and retailers. Using only the finest hand-picked wood selections from eco-friendly resources, precision metal components, and a superior lacquering process, each Drum is a piece of art. Made and assembled with care to meet advanced demands and set the bar for professional drums, ProLite combines superior tone, leading-edge design, function and precision to deliver the perfect tools for your musical inspirations. The perfect match for your gig, no matter what style you play! The core of the ProLite series is the sound spectrum provided by the extremely thin Vintage Maple shells with reinforcement ring. These provide an unmistakably open sound and an enormously wide tuning range for practically all styles of music. SONOR’s Vintage Maple shell is characterized by a soft, warm tone that highlights the lower pitches and provides balance in the mid-range and treble, without sacrificing projection and power. 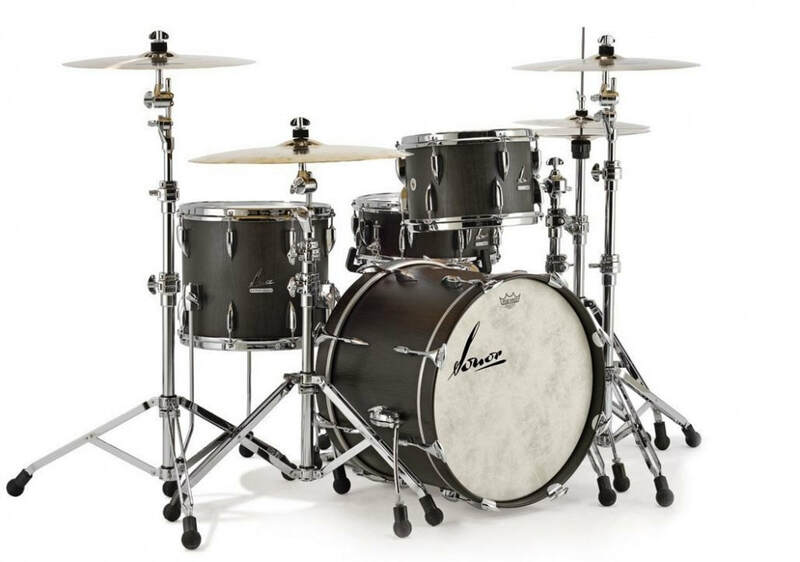 Cross Laminated Tension Free Process (CLTF) - SONOR cross-laminates shells for superior stability, sonically enhanced resonance and spectacular tone. The CLTF process is a result of years of research by SONOR craftsmen. Optimum Shell Measurement (OSM) - SONOR implements a slightly narrow outside shell measurement for optimized head contact. This is a SONOR specialty, resulting in excellent tone, better sustain and controlled decay. Photo shown is a similar kit in 20, 10, 12, 14. Finishes : Semi Gloss Veneer, High Gloss Veneer, High Gloss Fade Veneer, Solid Semi Gloss, Solid Fade High Gloss, Sparkle High Gloss, Sparkle Fade High Gloss, Wraps, RAL Colors. Please change the country to Singapore and we will match all prices quoted on the configurator. Photo shown is similar to the actual kit.